Wake Creative was lucky enough to see Steve grow his business from an early stage. We both joined a networking group at the same and we were both at similar stages in our companies when we joined – infancy and hungry to succeed. After getting to know Steve and watch him grow his business into an amazing general contracting service, he approached us to take his brand to a new level. He was operating with an old logo that wasn’t attracting the right type of customer. It was giving him a negative stigma and he wanted an image that worked with his level of quality and service. As always, the process began with a sit down chat to better understand what Allendale’s long term goals were. Up until this point the word “construction” had been used in his identity. He wanted a new image that addressed his other services and the word construction only applied to a small percentage of his work. We got hard to work looking at some of his competitors and the industry. What we formulated was that the industry he occupied in the Edmonton region all shared the same look in terms of identity. We knew we had an opportunity to develop a logo that was unique and addressed his love of nostalgia. Our first order of business was to sell Steve on the idea of dropping the word “construction” from his business name. The brand he was building needed a simple understanding with a touch of sophistication. We then created a word mark logo with supporting secondary logos that created versatility and a unique look that communicated his level of service and high regard for quality materials and craftsmanship. 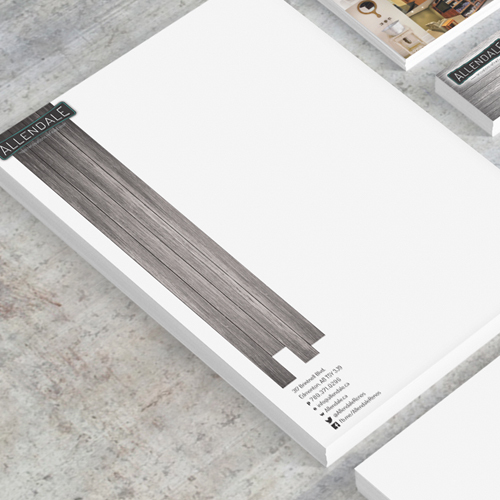 After you have laid the foundation in a solid logo, developing the rest of your identity materials becomes easier. You know the look, feel and emotional messaging required to bring that logo to life. Making it a finger print in your industry. 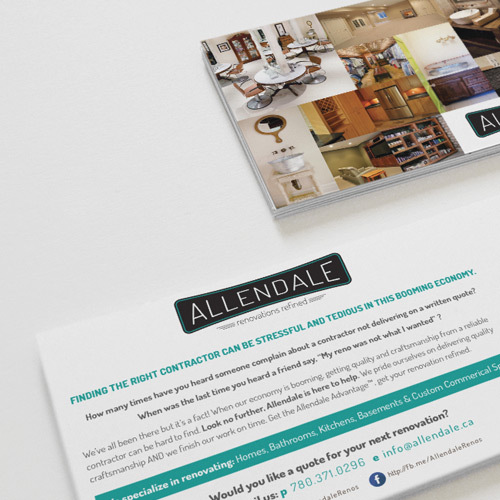 We brought Allendale’s logo to life through his business card, postcard and lawn signs. He is a master craftsman when it comes to wood and we wanted to give his brand that rustic-modern-earthy-feel. 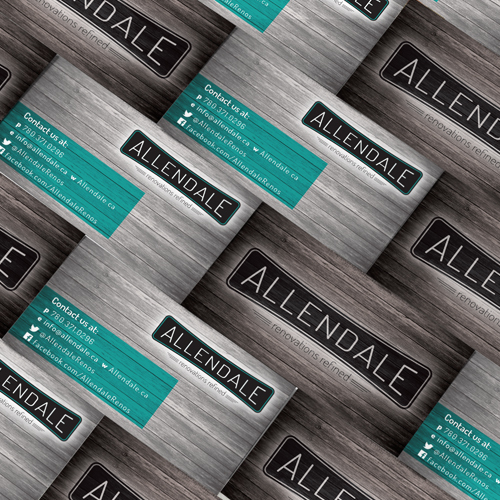 Allendale never cuts corners when it comes to finishing so straight lines, grid systems and white space were the perfect solutions for his materials. I’ve had the privilege of knowing Dennis Michael, owner of Wake Creative for over 2 years. 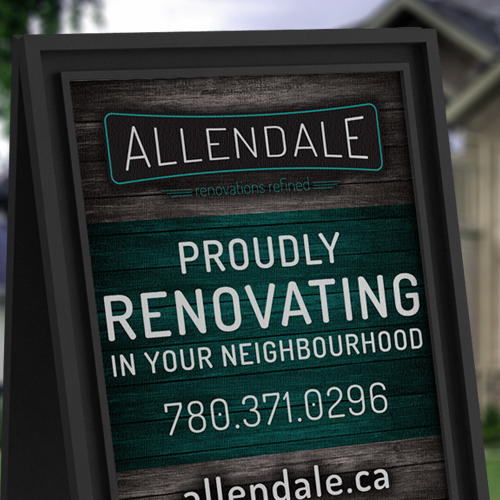 I run a high end renovation company focusing on all types of residential work as well as custom commercial projects. 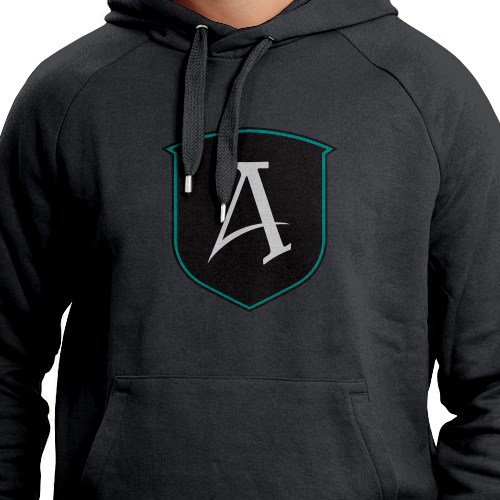 Below I have added what our first logo looked like (right) compared to what Wake Creative did for us, I think you’ll agree the proof is front and center.